The Trustees of The Victoria Hall are delighted to announce they have been awarded £45,500 from Biffa Award, a multi-million pound fund that helps to build communities and transform lives through awarding grants to community and environmental projects across the UK. The much needed Victoria Hall kitchen refurbishment project was awarded funded under Biffa Award’s Community Buildings theme. By establishing a need for improvements to the kitchen through consultation with groups and community users, the Trustees (a group of 12 local volunteers, each of them with a specific area of expertise, who manage the Victoria Hall charity) were then able to seek out specialist advice on options and alternatives and select potential suppliers to provide quotations and then to complete the refurbishment. The existing kitchen facilities were out of date and in much need of a full refurbishment in order to meet and exceed current regulations and legislation and so the project undertook to strip out the existing kitchen and dishwashing facilities and refurbish them with brand new equipment, flooring and wall cladding. The electrics, ventilation, water, gas and fire safety were also all renewed to address the safety of both patrons and tenants and to safeguard this lovely listed building. 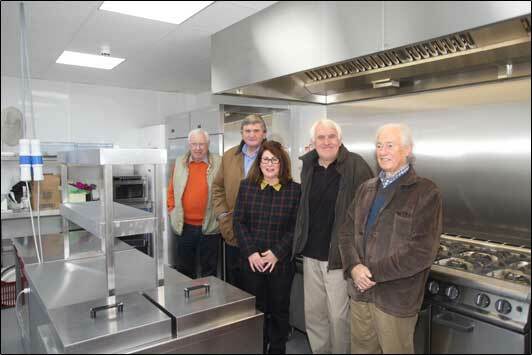 The smooth and timely installation process was undertaken by KCM Catering Equipment based locally in Grantham. The Victoria Hall is a Grade II listed building used by the local community, the town centre location office for the Town Council, and a meeting place/office for Rutwel (the community support service for adults with learning disabilities). The Victoria Hall is also a town centre art gallery, the home to Rutland Arts Theatre Group productions and venue for yoga classes, dance classes, NADFAS/ODFAS group monthly meetings, U3a group meetings monthly and the county and town community building for weddings, parties, charity events, christenings and funeral wakes. There are also regular craft and antique fairs, the superb monthly Sunday Oakham Quality Market, along with Oakham Town Partnership Christmas events and other church and community group activities. The Victoria Hall is unique and there are no other similar facilities in the town. Oakham is a growing market town with a population of over 11,000 and a further 30,000 live in the surrounding areas of Rutland. To meet the growing demand for community facilities the Trustees continually review its needs and look to make improvements to the hall. The Rotary Club of Rutland, The Oakham Memorial Institute, The Rutland Trust, Jeakins Weir, John Sims, Trustee, Richard Adams (Rutland Calendars), Market Harborough Building Society Charitable Foundation and NADFAS Oakham Group ODFAS. Call in or telephone for further enquiries or to make a booking. Telephone 01572 722496. We look forward to seeing friends old and new.